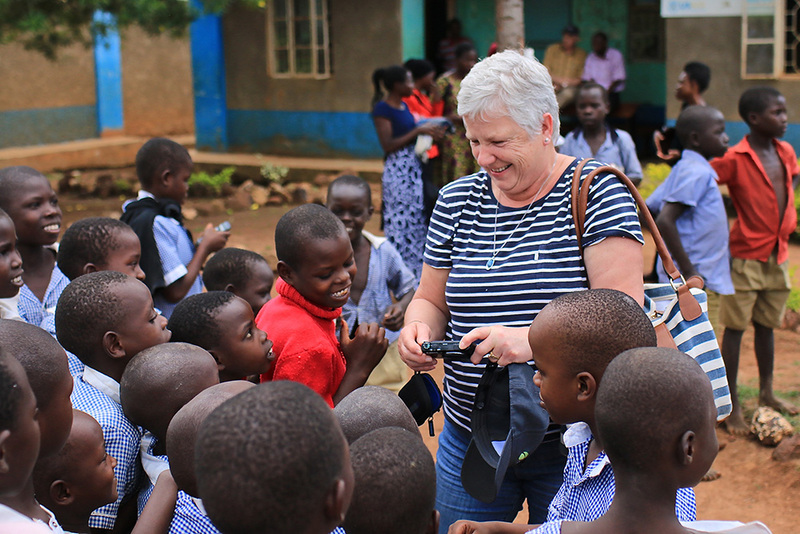 Gerry Prins embraces her first visit to Uganda, entertaining kids with photos of snow in Canada. "Most Welcome!" That is how we were greeted over and over again during our trip to Uganda with Food for the Hungry (FH) Canada. In April we had the most amazing trip to Uganda in East Africa. We had the privilege to spend the first week there with two other dairy farmers and their wives from British Columbia. Our leader was our son Michael who works for FH Canada in Abbotsford. This was a trip to encourage the people in Mbale with whom FH Uganda works, and especially the dairy program that they introduced a few years back. We were driving through the community of Nashisa towards the school buildings...in the distance we saw a blue patch that started moving toward our van. The blue kept coming and we finally realized that it was all the school children in their blue uniforms. Non-North American schools often require their students to wear uniforms. The school had over 1,100 children and they totally surrounded our van with cheering, singing, and dancing. There even was a small music band in the parade and people waving branches! 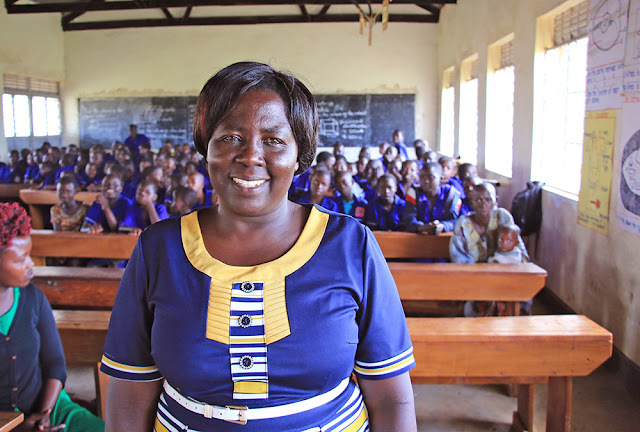 We slowly made our way to the school buildings where we were met by Bira, the head teacher. She took us into her office where we signed a guest book. All the while, everybody wanted to shake our hands; small girls would curtsy to us and even some ladies would fall on their knees to welcome us—a traditional sign of respect in Uganda. We finally made our way through the excited crowd to one of the big classrooms which is also used as their community centre. 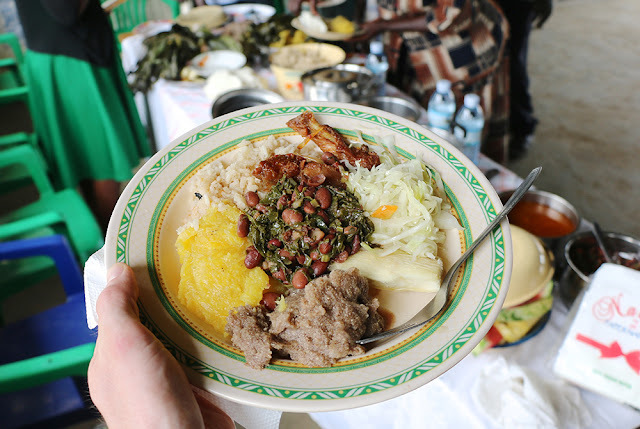 There we were welcomed with blazing hot milk with tea, fresh bananas, and groundnuts. A group of older students sang and danced, and some of the local dairy farmers and their wives performed an entertaining skit. We were treated to a delicious lunch of posho (maize porridge), matoke (green banana steamed in banana leaves), rice with sauce, chicken, and chapati (flatbread). One of the best parts of traveling is sampling diverse cuisine. Being the principal of an elementary school is a huge job. Bira does it all with a smile. During lunch, we visited with Bira who told us more about the school. There are 1,107 students and 18 teachers. Some of the higher grades have two teachers but the younger children only have one teacher per class of roughly 120 kids. School runs six days a week starting at 7am until 5pm. There is a breakfast break at 10am and lunch is served from 1pm—2pm. Most students receive breakfast and lunch unless they live close to the school–some kids walk up to five kilometres to attend school. She also informed us that now that white people had visited her school enrolment would go up. If white people come to visit, it must be a good school! Before and after lunch we walked through the community of Nashisa. We kept meeting more and more people and we certainly were "most welcome." We visited, talked, and prayed with quite a few dairy farmers. Many of them were ladies that took care of the cows. They would talk about how happy they were with the one cow. It meant that the milk would make their children healthier and with the extra milk they sold they were able to buy school uniforms and school supplies. 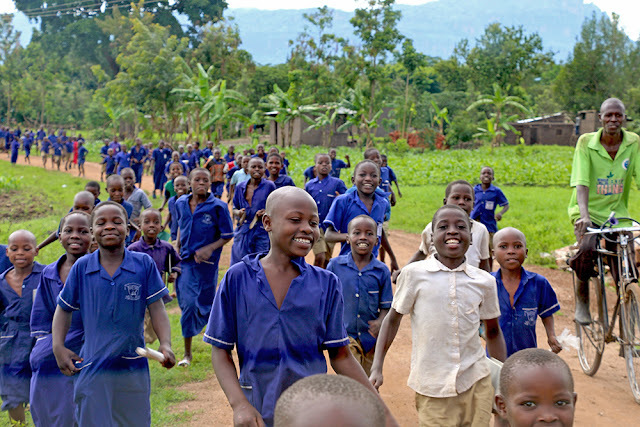 (In Uganda, children aren’t permitted to attend school unless they have a uniform). 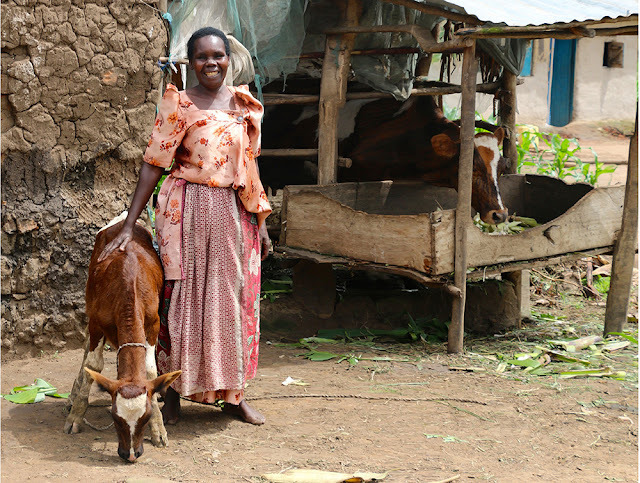 Dairy cows enable mothers to make a living from the sale of dairy products and provide their own children with the nutrition they need. They start with a group of five people; one person (decided among the group) will receive the first cow. FH purchases the pregnant heifer, often from Kenya. The first calf, at the age of six months, is passed on to the next two people in that group. The following calves from those initial cows will be passed along to the other members of the group until everyone has their own, milk-producing dairy cow. We witnessed the "giving away of a calf" twice that day. The dairy group is also happy with bull calves since they can sell them for a good profit. The transfer of a calf is always a joyous occasion. Some of the dairy farmers are also working with creating biogas. A biogas digester treats organic waste like cow manure and produces biogas fuel for cooking and lighting. It was very interesting to see it work and they were all very proud of their cookstoves and lights. Biogas stoves reduce smoke, eliminate deforestation, and are much safer than wood fires. At the last farm, we ended up with quite a group of farmers and their families. First, a calf was given away and then the chairs came out and we sat under the big tree for shade. The Ugandan farmers wanted some input from our Canadian farmers. A bit of a dairy meeting so to say. But before all this, they had a lengthy discussion about us and what our new Ugandan names would be! My husband, Peter, was given the name Kuloba, meaning "investing in the soil." I received the name Nelima, meaning "time of cultivation." After our new names were presented it was time for our Canadian men to give some advice, ideas, and especially encouragement to the farmers there. 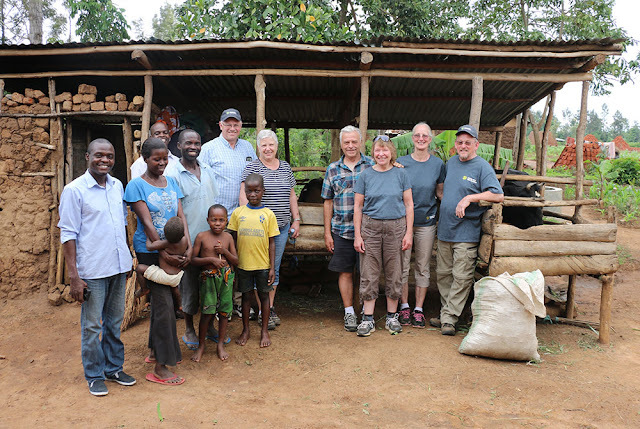 FH Uganda works with a community for 10 years towards self-sustainability. When the community shows signs of being able to carry forward their own development without FH’s support, it’s time for a “graduation” and for FH to say farewell. Nashisa is on track to graduate next year which, from what we saw, will be quite a celebration! Gerry Prins hails from Lacombe, Alberta, where she and her husband Peter operated a dairy farm for 31 years. Now that they've sold their herd, Gerry is able to pursue her interest in overseas development more. When they aren't travelling Gerry can be found in her vegetable garden, volunteering for her local thrift store, or enjoying her three grandchildren. Food for the Hungry: You are Most Welcome!